1. PARTIES. This Lease Agreement is made and entered into by and between the parties indicated above as Landlord and Tenant. 2. PREMISES. Landlord hereby leases to Tenant, and Tenant hereby leases from Landlord, upon the terms and conditions herein set forth, a building, improvements and parking lot commonly known as ____________________________, hereinafter referred to as the Premises, and more particularly described in the attached Legal Description marked Exhibit A. 3. 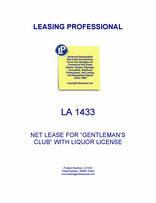 LEASE TERM AND COMMENCEMENT DATE. This Lease shall be for a term of five years, and shall commence on ________, 20___, and shall end on last day of _______, 20___, hereinafter referred to as the Termination Date. 4. RENT AND TRIPLE NET EXPENSES. (i) Base Rent for the Premises for the Lease Term is $_______________, which is to be paid in monthly, consecutive installments of $_____________/mo commencing with the first such installment payment being paid to the Landlord on or before _______, 20___, and the same amount to be paid on the first day of each consecutive month thereafter for a total of sixty (60) installment payments, which covers the five (5) year term of the Lease. (ii) Additional Rent consists of all expenses, including all taxes and insurance, related to ownership, occupancy, and operation of the Premises and any conducted or maintained therein. Such expenses include, but are not limited to all real estate and personal property taxes, and all other expenses related to the upkeep and maintenance of the parking lot, the building structure, the HVAC, electrical, roof and plumbing systems contained within or without the Premises. 5. LATE FEES. Tenant agrees to pay Landlord a late fee of 5% of the monthly lease payment amount on any monthly rent payment that has not been received by the Landlord within ten (10) days of being due hereunder. Or such other person and/or place as Landlord may from time to time designate in writing. (a) $1,000,000.00 [each person] premises liability coverage, to include coverage for liability arising from claims or cases involving those activities or events in any way related to licensed commercial vendors who cause the intoxication of a patron who subsequently causes injury and are held strictly liable, or otherwise liable, for such liability. (b) $1,000,000.00 for property damage. (ii) Tenant shall cause Landlord to be scheduled as an Additional Insured and a Loss Payee on all of these coverages, and on the date of Closing and on _______, of each year of the Lease Term the Tenant shall deliver to the Landlord written certification of insurance that complies with all of the provisions set out in subparagraph (i) and (ii) above. (iii) Failure to supply such certification is an event of default of this Lease Agreement. 9. LANDLORD EXPENSES. Tenant agrees to pay on demand any expenses incurred by Landlord to keep the Tenant’s Premises in compliance with any City, State or Federal law or regulation. 10. SECURITY DEPOSIT. Tenant shall deposit with Landlord upon execution hereof, the sum of __________________ as security for Tenant's obligations hereunder. If Tenant fails to pay rent or other charges due hereunder, or otherwise defaults with respect to any provision of this Lease, Landlord may use, apply or retain all or any portion of such deposit for the payment of any rent or other charge in default or for the payment of any other sum to which Landlord may become obligated by reason of Tenant's default, or to compensate Landlord for any loss or damage which Landlord may suffer thereby. If Landlord so uses or applies all or any portion of such deposit, Tenant shall within ten (10) days after written demand therefor deposit cash with Landlord in an amount sufficient to restore such deposit to the full amount herein above stated and Tenant's failure to do so shall be a material breach of this Lease. Tenant shall not be required to keep such deposit separate from its general accounts. If Tenant performs all of Tenant's obligations hereunder, such deposit, or so much thereof as has not theretofore been applied by Landlord, shall be returned, without payment of interest or other increment for its use, to Tenant (or, at Landlord's option, to the last assignee, if any, of Tenant's interest hereunder) at the expiration of the Term hereof, and after Tenant has vacated the premises. No trust relationship is created herein between Landlord and Tenant with respect to such security deposit.